Cooler Master previews the GeminII M4; a new cooler set to be released next month for $29.99. Full details at CM's website. 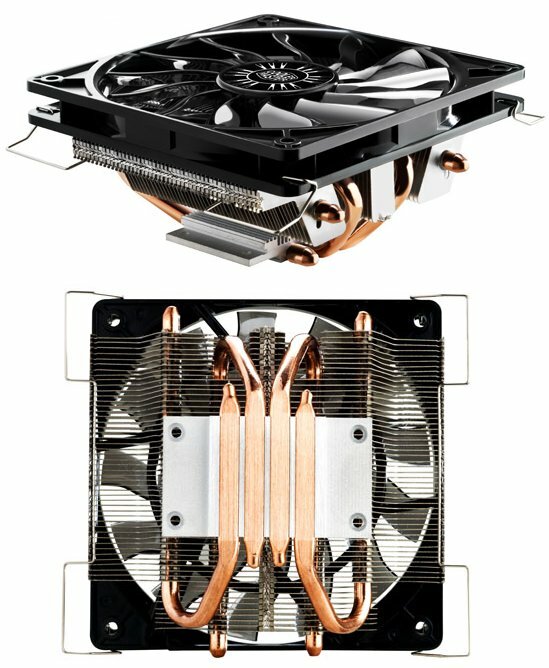 Cooler Master, an industry leading chassis, thermal solution, peripheral, and accessory manufacturer, announces a CPU cooler with huge performance packed into a seemingly miniature package. That new compact CPU cooler is the GeminII M4 – a GeminII series cooler. Redefining cooling performance for space restricted environments, GeminII M4 is engineered to maximize cooling with its minimal CPU contact gaps and four extremely efficient direct contact heat pipes that provide excellent heat dissipation. Standing at a mere 59mm / 2.3in tall, it is uniquely suited to thrive in the small spaces afforded to CPU coolers in HTPCs and other slim systems. This small size is accomplished by developing a new smaller 120mm fan that is only 15mm thick as opposed to ones that are traditionally 25mm. This newly developed fan not only provides the benefit of a 10mm shorter height, it maintains high airflow - providing up to 58.4CFM when set on high speed. To ensure that the GeminII M4 adequately takes advantage of this improved fan, a unique heat pipe layout is utilized that orients the heat pipes in a tighter “C-shape” rather than the standard “U-shape”. This directs the flow of heat more efficiently to the aluminum fins where the heat is exhausted. Much like the GeminII S524, GeminII M4 features an airflow design that is 90° rotated to avoid heat radiating from the motherboard. In turn, this orientation simultaneously provides a steady airflow to motherboard chipsets surrounding the CPU socket. GeminII M4 will be available in June, 2012. Price and availability may vary based on region.